Dominican Preacher and his Impact on Renaissance Art in Florence. The fiery Dominican monk Girolamo Savonarola had a considerable effect on Renaissance Art in Florence in the late quattrocento and early cinquecento, much of which he condemned as profane. A fanatical fundamentalist preacher, he was an uncompromising critic of corruption within the church, and also the decadence and debauchery within Florentine society. He violently criticized the Medici family in Florence, for instance, as well as the artists who did secular commissions for them. Following the overthrow of Medici rule in 1494, Savonarola used his authority to establish a democratic republic in the city. He also denounced the Florentine Renaissance for its profane works of art. In his opinion, the only proper art was Biblical art produced to help illiterate Christians understand the Bible. Pope Alexander VI (Rodrigo Borgia) issued a number of formal restraints against him, all of which he ignored. Inspired by Savonarola's extremist oratory, packs of his followers would search houses and public buildings for the sinful worldly art that he condemned - including many female nudes and male nudes - a process which culminated in 1497 in the "Bonfire of the Vanities" - a huge bonfire of books, paintings and sculpture of profane subjects, as well as mirrors, cards, dice, musical instruments, and jewellery. The great Florentine painter Alessandro Botticelli (1445-1510) - creator of secular masterpieces like "Primavera" (1482-3) and "Birth of Venus" (1484-6) (both in the Uffizi Gallery, Florence) - was so affected by Savonarola that he abandoned painting altogether for several years, as did the High Renaissance artist Fra Bartolommeo (1472-1517), who - along with Lorenzo di Credi (1459-1537) - burned all his paintings and drawings to show contrition for his sins. Other Early Renaissance artists directly affected included the family of Andrea Della Robbia (1435-1525) - noted for their terracotta sculpture - as well as the architect Simone del Pollaiolo (14571508), better known as Il Cronaca. Savonarola then attacked Pope Alexander VI in Rome, whom he regarded as the greatest of all sinners. This - despite, or perhaps because of, the fact Alexander had fathered eight children by at least three different women, and had not the slightest glimmer of religious feeling - proved to be Savonarola's undoing, and ultimately led in 1498 to his excommunication and execution as a heretic in the Piazza della Signoria, Florence. At least two portrait paintings of him exist: one, in the Museum of San Marco, Florence, (1498) was painted by Fra Bartolommeo and shows him in profile; another, now in the National Gallery, London, is by an anonymous painter and shows him hanging on the gallows about to be burned. Although many of his concerns regarding clerical corruption were perfectly reasonable, one feels that a number of masterpieces, including "David" (c.1440, Bargello, Florence), the immortal bronze sculpture by Donatello (1386-1466), would not have survived if Savonarola had achieved the power he sought. As it was, he had a powerful effect on both the Early Renaissance painting and High Renaissance painting of the period: Botticelli's work in the 1490s, for instance, develops a darker and more dramatic quality - see his Mystic Crucifixion (1497, Fogg Museum), and his Lamentation over the Dead Christ (1492, Alte Pinakothek, Munich). Born at Ferrara, the son of Niccolo Savonarola and Elena Bonaccorsi, he received a strict education from his paternal grandfather, a man of rigid morality and medieval religious principles. He was also strongly influenced by the teachings of Thomas Aquinas. As a result, from an early age he railed against the decadence that corrupted art, poetry, and religion itself, being especially critical of corruption amongst the clergy. In 1475, he left home and abandoned his medical studies in order to enter the Dominican order at Bologna. In 1479 he returned to Ferrara, where he taught bible studies at the Convento degli Angeli. 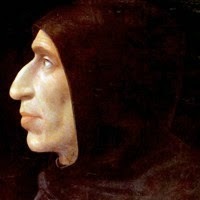 In 1482 Savonarola travelled to Florence to take up the position of lecturer in the convent of San Marco, where he gained a widespread reputation for his scholarship and asceticism. His ability as a preacher however was nothing out of the ordinary - at least until a sudden revelation gave him the confidence to begin his inspirational sermons. During the Feast of Lent at San Gimignano in 1485 and 1486, he announced his famous propositions: the church needed to be reformed; it would be scourged and then renewed. In 1487, he left Florence and went to Bologna where he took up a more senior teaching position. A year later, he was sent by the Dominican authorities to preach in various towns and cities, before Lorenzo de' Medici managed to have Savonarola sent back to Florence in 1490. Unknown to Lorenzo, Savonarola would soon become his most dangerous enemy. Not long after arriving in Florence, Savonarola gave a series of sermons fiercely criticizing the abuses practiced by the civic authorities, whose overthrow he predicted. Lorenzo tried to silence Savonarola with a mixture of threats and flattery, but his own life was ebbing away, while the reaction of people on the streets to Savonarola's views grew increasingly favourable. Under threat from Savonarola and finally ousted in 1494 by the invasion of the French King Charles VIII, the Medicis were banished from Florence. Savonarola's positive role in negotiating with Charles and with squabbling factions within the city's council led to a significant rise in his authority, which he employed to set up the most democratic government, the city had ever seen. According to his scholarly supporters, he had no interest in politics, but simply wanted to establish Florence as a smoothly-run Christian republic that would instigate the necessary religious and secular reforms throughout Italy. However, critics of Savonarola lost no time in forming an opposition party known as the Arrabbiati, which rapidly agreed an alliance with the Duke of Milan and the Pope. It was the pontiff, Pope Alexander VI - under pressure from the Holy League who wanted to expel the invader Charles from Italy - who then summoned Savonarola to Rome. When Savonarola declined, he was banned from preaching, and then excommunicated. In response, the Dominican staged his "Bonfire of the Vanities", when his supporters publicly burned thousands of so-called "profane" objects including cosmetics, art, and books in Florence, during the Mardi Gras festival. It was also during this time that Savonarola wrote his spiritual masterpiece, the Triumph of the Cross, a celebratory account of the victory of the Cross over sin and death and a discussion of what it means to be a Christian. Eventually Savonarola, together with his close followers Fra Domenico, and Fra Silvestro Maruffi, were arrested, imprisoned and tortured. On the morning of May 23, 1498, the three were condemned as heretics and hanged. Their bodies were burned and their ashes scattered in the River Arno. The Medici returned to Florence in 1512, thus ending Savonarola's short-lived democratic republic. Although ousted once more (1527-30), Pope Clement VII (Giulio de' Medici), with the help of an army from the Holy Roman Emperor, restored Medici rule. If Savonarola's influence in Florence was short-lived, his impact in the rest of Europe endured for longer. In Germany and Switzerland, for instance, his anti-corruption stance found strong support among the early Protestant reformers, including Martin Luther himself, who praised him as a martyr. Luther's similar protest movement, known today as Protestantism, delivered a debilitating blow to the development of the Roman Church, from which it is still trying to recover. See: Protestant Reformation Art (c.1520-1700) and Catholic Counter-Reformation Art (1560-1700). It is perfectly conceivable that Savonarola's fundamentalism would have led to the banning of all secular art, as well as Christian art, to which he was opposed. As it was, an unmistakable gloominess appeared in Florentine paintings for years after Savonarola's death. Sadly, Savonarola-style artistic censorship has reappeared many times during the modern era. The Nazis burned works they considered degenerate art, while the Taliban in Afghanistan and the self-proclaimed Isis Caliphate in Iraq have destroyed thousands of years worth of sculpture and other artistic treasures.  Renaissance Architecture (c.1400-1600) characteristics and buildings.  Florence Cathedral, Brunelleschi and the Renaissance (1420-36).  Renaissance Sculpture in Italy (c.1250-1530).  Renaissance Art in Rome Under the Popes (1400-1600).  Renaissance Art in Venice (c.1400-1600).  For more about Renaissance art in Tuscany, see: Homepage.